This video is from back when I was just learning. We were still searching all over for the litter box. It used to be under the toilet seat. Then it was GONE!!!!! We just jump up, jump down, and jump back onto the seat again. Not having the litter any more... didn't feel, you know... it didn't feel right with all that water so close. I'm over it now, but it was like the water was gonna get me. Hey, Cooper. That's one rad video. 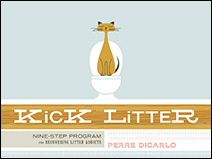 Now that you've kicked your litter addiction, I'm sure you're destined for stardom. Hang in there! Tell Moxie & the big guy hi for me.